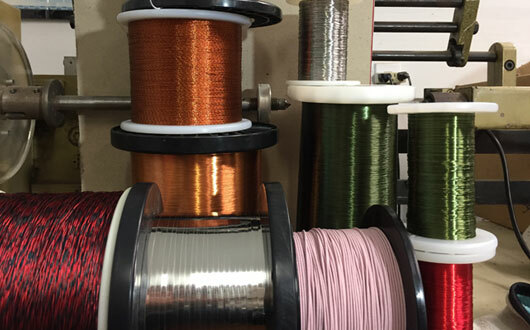 Our Product Line – Wire: Nichrome, Resistance, Magnet, Litz, Tungsten, Lockwire, Specialty Metals/Alloys, Round & Flat, Plated & Un-plated, Custom Spooling & More. 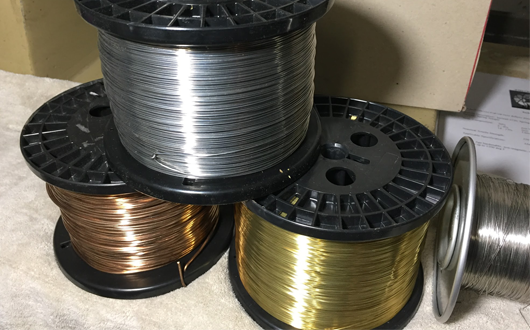 Nichrome ™*, and various other resistance/mechanical alloy wires from size 4 – 50 AWG: Alloys 30, 60, 90, 120, 180, 294, NiCoFe 294, Monel-400 ™**, Alloys 800, 875, Inconel x750, Nickel 200, 201, 205, 270, Manganin, Stainless Steel 300 series. 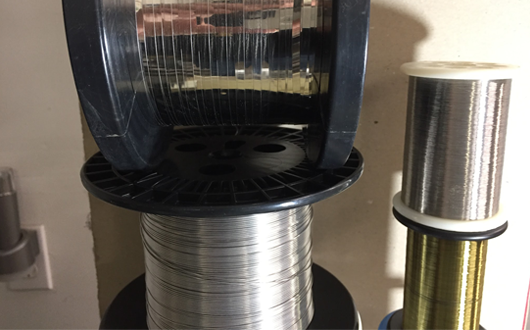 For more tech data on Nichrome, click the link below or download our software. 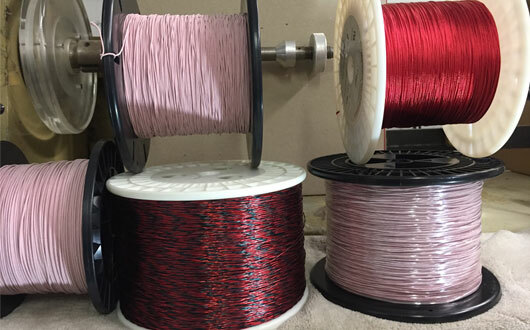 Single-end, Twisted, or Parallel-bonded, standard and non-standard constructions, sizes 4 – 54 AWG Round, Thermal Classes 105 C – 240 C, Single to Quadruple Builds, Bondable Coatings Available, Multi-conductor, Colors, Applicable Commercial/Gov’t Specification: NEMA MW 1000, J-W-1177, M1177, Mil W 583C. Click on link below for more details or download our software. Round constructions with strand sizes 20 – 48 AWG (6 AWG Max Overall Size), available “Served” with nylon or jacketed with FEP Teflon ™+, or unserved & unjacketed. Individual strands supplied with standard solderable insulation or other non-std insulation. “Single” & “Heavy” build films. 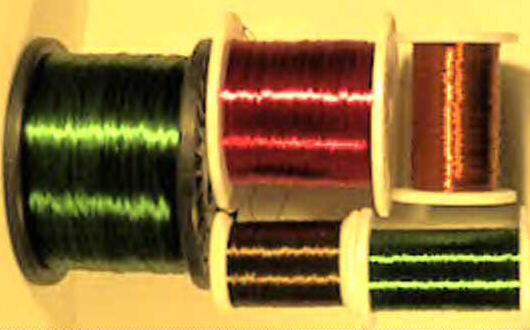 Custom color codes and twisting available. Click on link below for more details or download our software. Copper Alloys (OFHC, BeCu, CdCu, Phosphor Bronze), Nickel and Nickel Alloys (Monel**400, Inconel** 600, x750), Stainless Steel 300 Series, Brass 70/30 (CDA 260), CDA Alloys, MS 20995 and ASTM specifications. Download our software for more extensive information. Tungsten, round sizes as small as .0005″ or flat precision rolled ribbons, 500 KPSI Tensile Strength. Round sizes, quoted on inquiry by inquiry basis. Gold, Silver, Platinum, Palladium, Round & Ribbon Sizes, 99.9% – 99.99% purities, Annealed (soft) or As Drawn. Tin, Tin-lead, Silver, Gold, Copper, & Nickel may be plated on a wide variety of core metals and alloys. Industry specs: ASTM B33, QQW-343, Mil T 10727, Mil Std 1276, Mil P 81728A, QQS 365, Mil G 45204. Round Wire .001″ – .080″ Diameters, +/- .010″ straightness, +/- .020″ standard length tolerance, most alloys available. Other tighter tolerances can be quoted.